So, today I am going to continue to post about my trip in Kuching, and today is just all about food! Kuching has too many good food to share, whereby I will separate them into few posts; do stay tune with me after the part 1 ya! 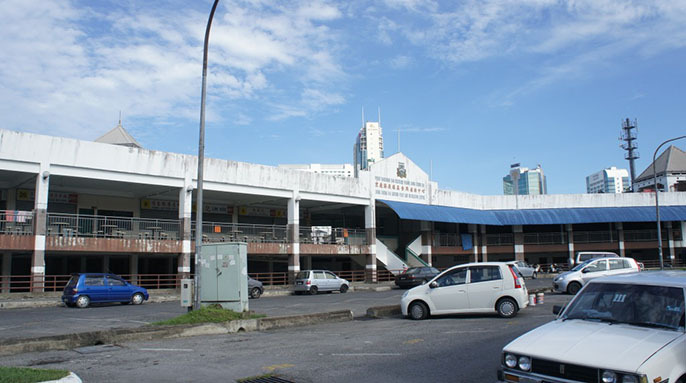 This is also one of my favourite food court in Kuching, as I always asked my friends to bring me whenever I travel to there. Well, what makes me so attempted to this place?! 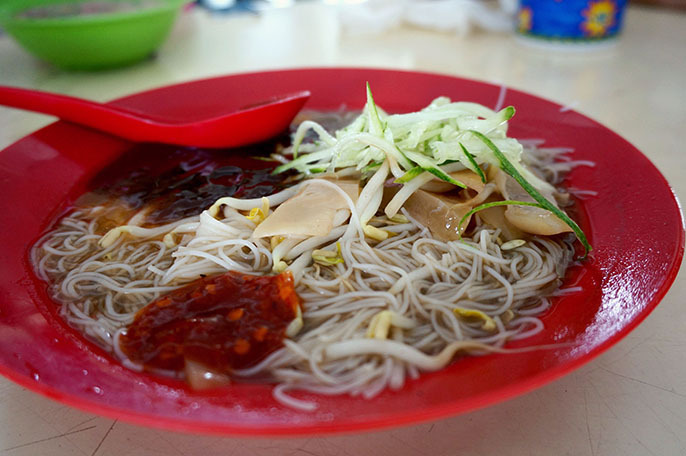 Balacan Bee Hoon is one of the famous local dish you must try in Kuching, and I don't think this is available in KL. It cooks with balacan source which has the tiny shrimp mixed paste with salt and fermented. If you like the smell and taste of balacan, then I bet you shouldn't miss this out! 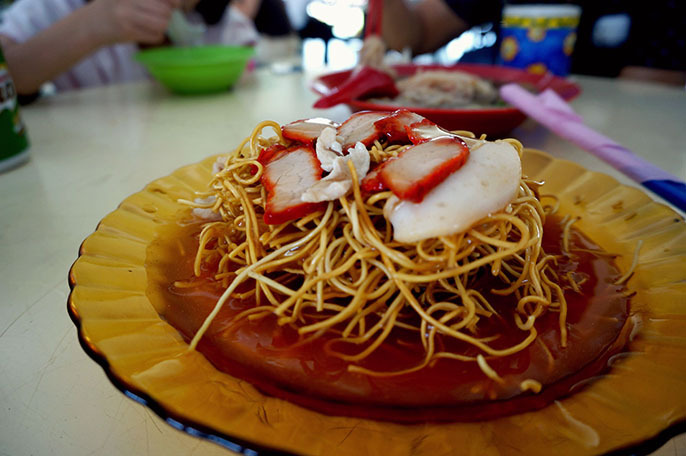 Another special dish you must try out at the hawker centre is the tomato noodle/tomato kueh Teow. The outlook and the texture are like "watan hor" that we have in KL, except the gravy is made of tomato sources. It has a nice balance in between the sweet and salt tastes. We ordered noodle and Kueh Teow both for try. Both are good in their own ways, but I would recommend you to have the noodle one, because it is more crispy to eat with the gravy. When you are looking for drinks, you should just order the sugarcane with coconut. It comes in a big glass and only cost about RM2. 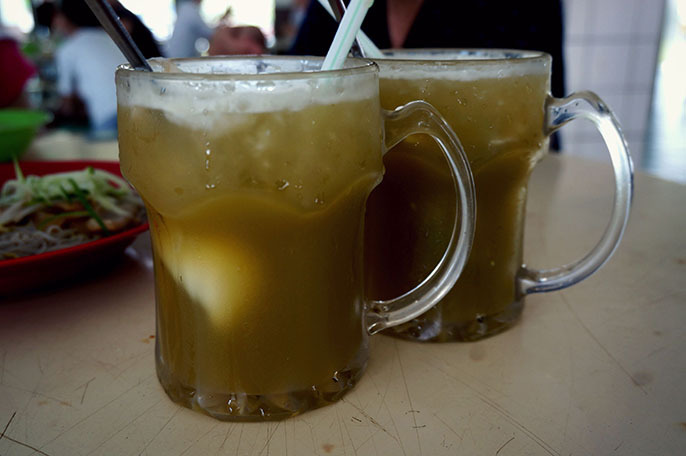 It is a must have refreshing drink during the hot weather in Kuching! 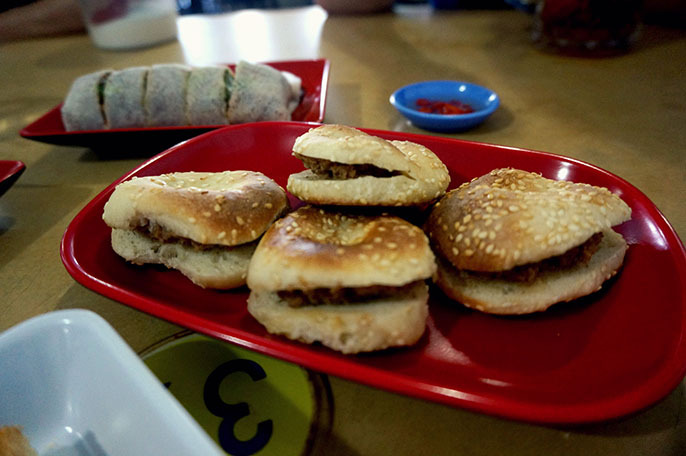 If you just want some snacks for small bite, maybe you can try the FooChow traditional Gong Pia, which fills with minced meat. 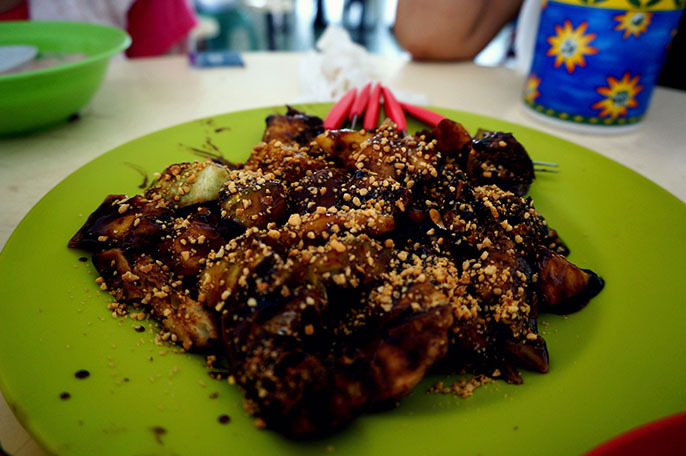 Or maybe fruits rojak with cucumber, papaya, pineapples, crispy biscuits, etc?! 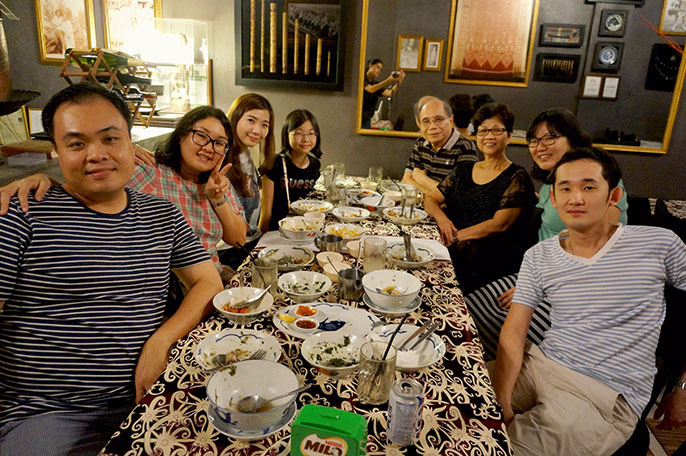 On the first night in Kuching, Kay and Stella invited us for a dayak cuisine. This is my first time having Dayak food although I have been there few times. 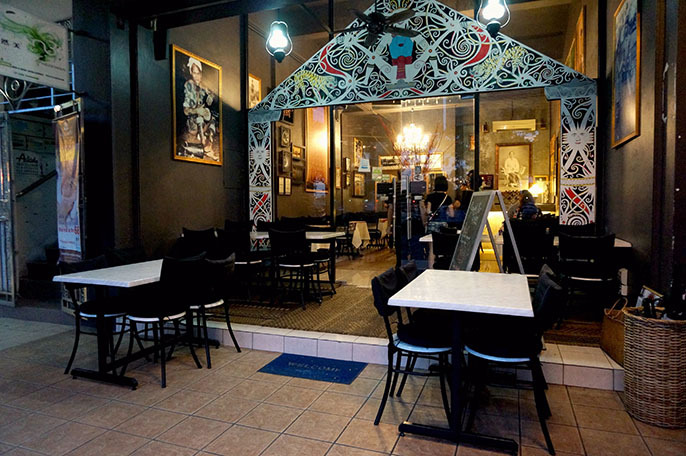 They introduced us this famous authentic Dayak food in Kuching, the.dyak which located at Jalan Simpang Tiga. Well, what Dyak restaurant serves? 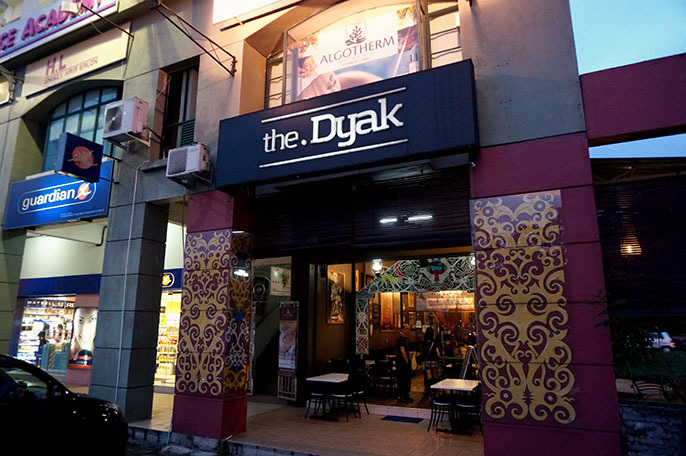 Dyak is pronounced as Da-Yak and was an old English spelling of the word which refers to the indigenous first nation people of Sarawak, Borneo. So, all the foods are the recipes from the local native people, Iban. Stella has advised us few times that we might not get use to their special taste or spice of the food, but it worth a try since we fly all the way from KL to Kuching. 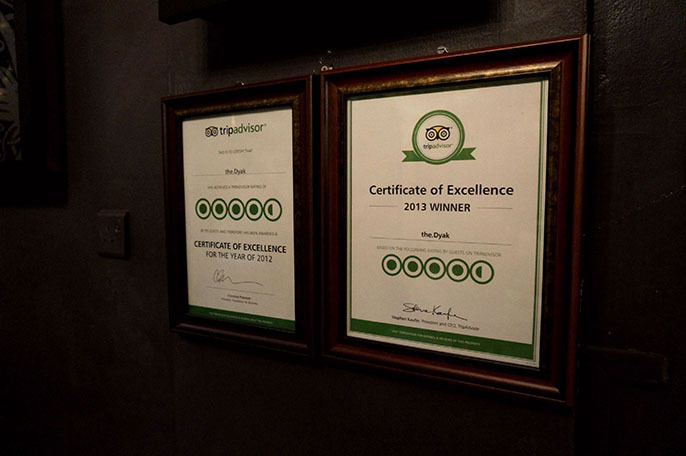 It is a very well known Dayak restaurant to visit in Kuching, as it won a certificate of excellence from Tripadvisor in year 2013. 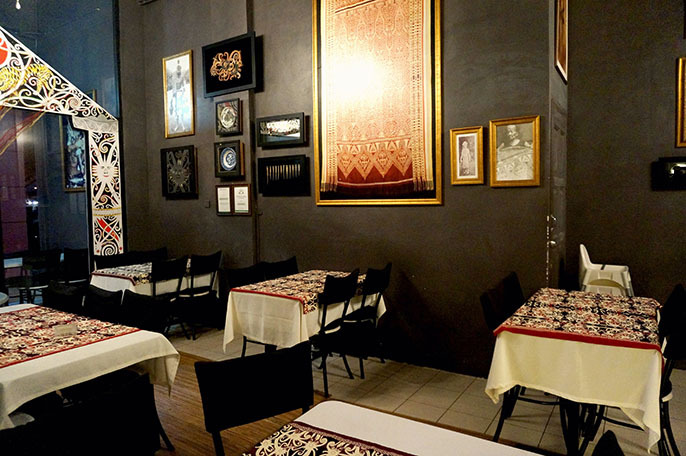 The restaurant has a lovely decorations with all kind of Iban feels. 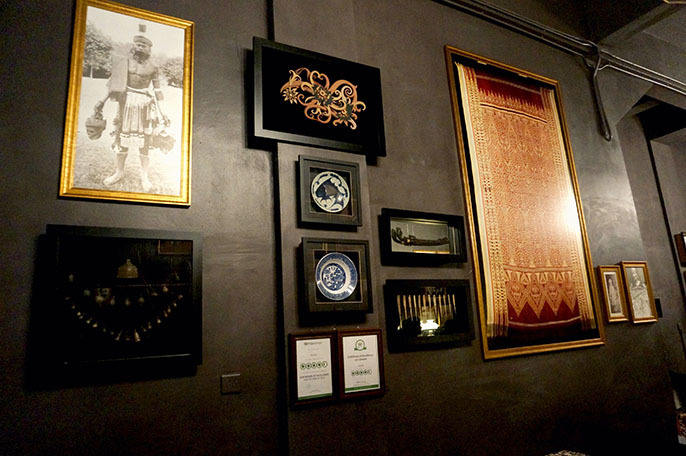 The wall at the place is full of interesting historical artifacts and paintings. It does help to learn a little bit about the Dayak history and culture during your visit. 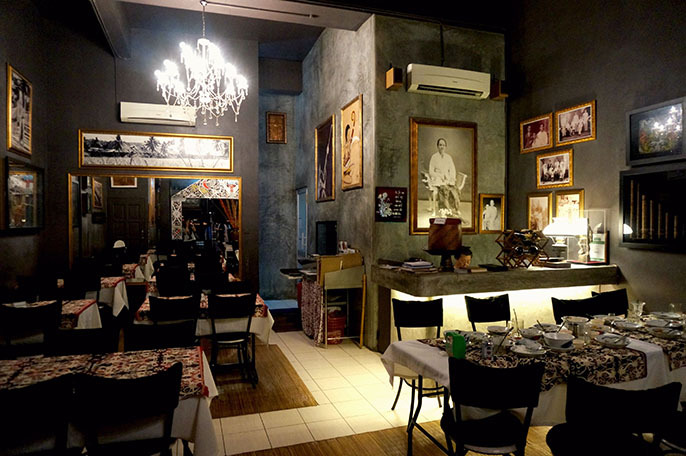 It doesn't have a big space like other big restaurants, so would suggest you to make a booking before you go; yet the overall atmosphere is pretty comfortable and calming. 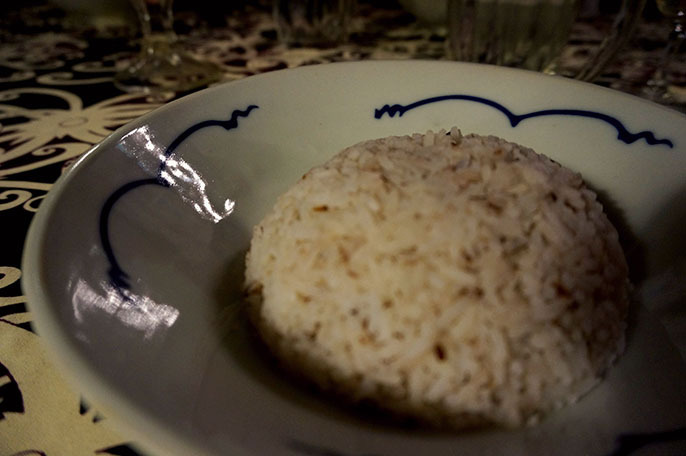 They do not serve white rice but a special rice brown rice with unpolished whole grain indigenous on replica Ching Dynasty porcelain kitchenware. It is RM3 per serving. 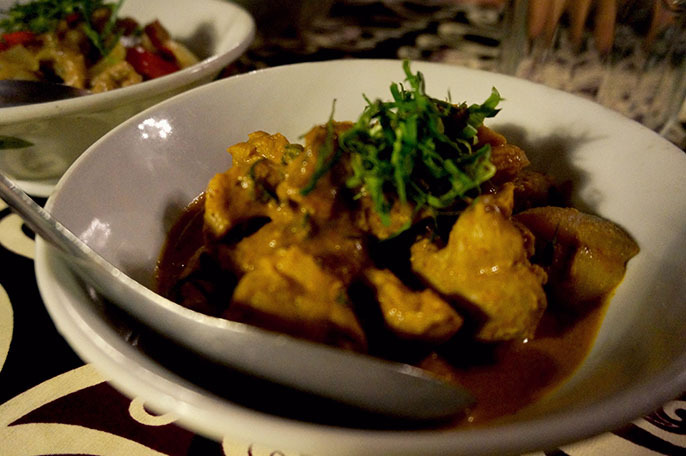 For the meat dishes, we have Jani Kari @ RM25, which is a simple pork dish with rich and spicy curry gravy. 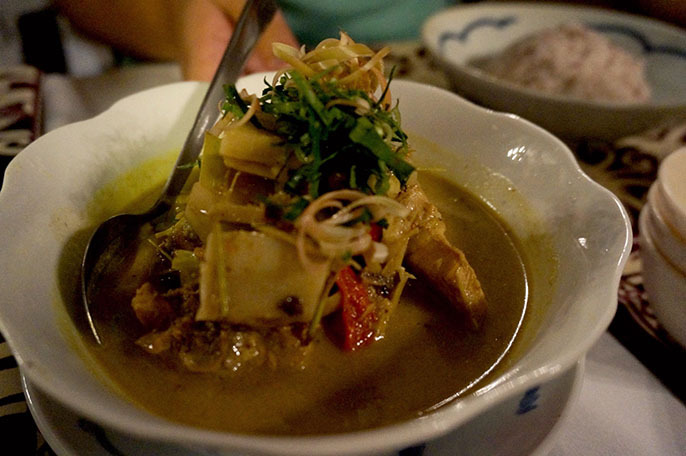 Manok Gulai Upa Kelapa @ RM25; chicken braised in a creamy and mild spicy soup with shredded coconut palm. Manok Lulun @ RM23, also known as Pansoh. 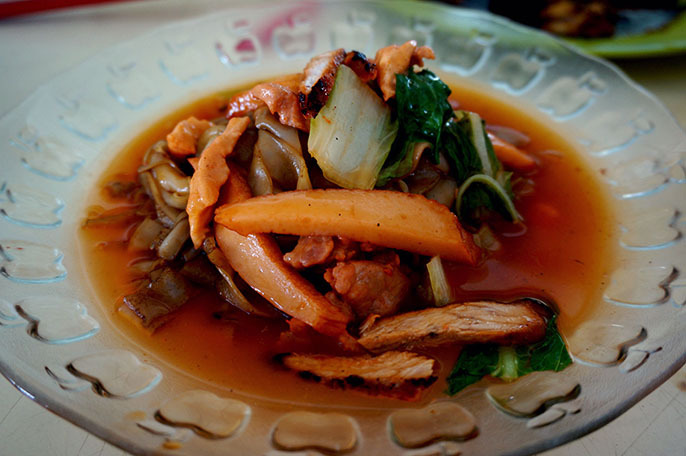 It is chicken dish which cooks in bamboo with the mixed of gingers, onions, lemongrass and tapioca leaves. 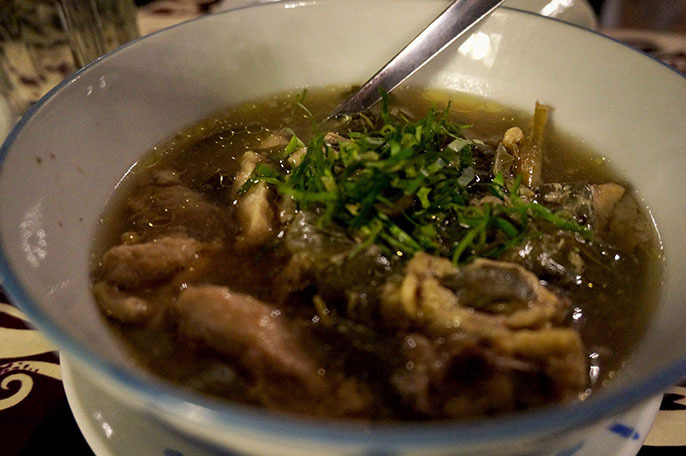 It's also a traditional dish serves at Dayak festivals. 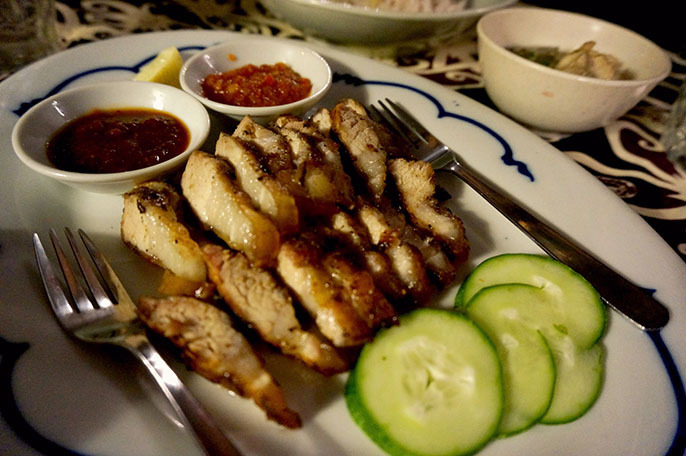 Jani Tunu @ RM25, is a grilled three layered pork, includes skin, fat and lean meat. It serves together with their special chef source, lime, cucumber and tomatoes. One of my favourite dish of that night. And for the vegetable delights, we have Paku Kubok @ RM10. 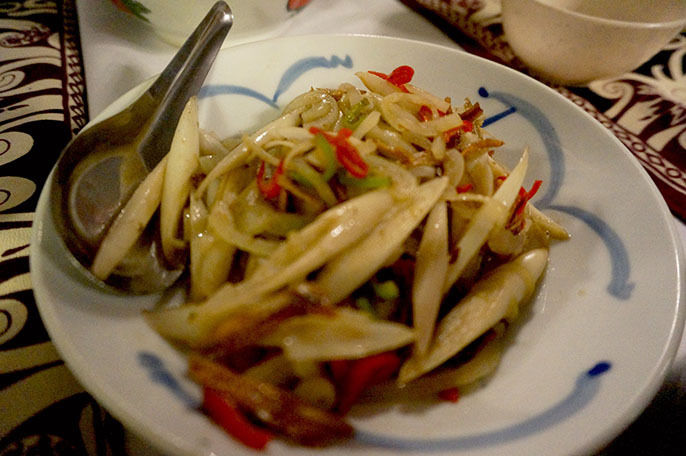 It is a hot and spicy vegetable dish which stir-fries with fragrant wild ginger flowers, anchovies and chilies. 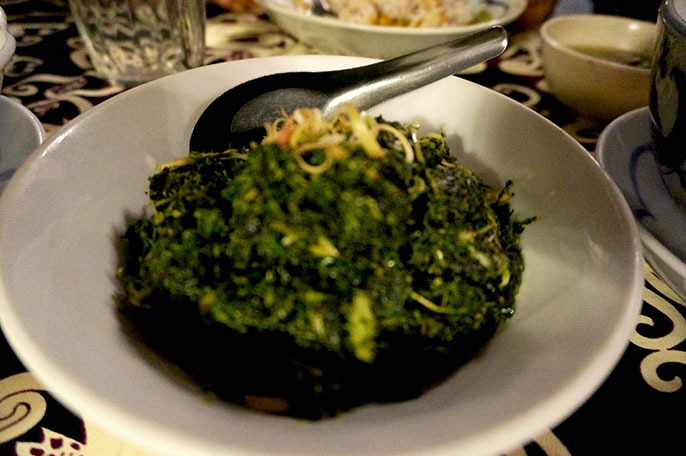 Daun Ubi Guring @ RM12, with mashed tapioca leaves stir-fries with garlic. 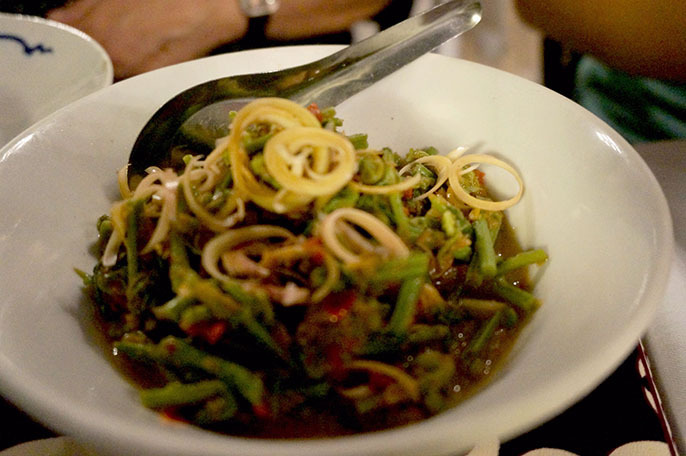 I personally do not enjoy this dish because I found it has a special strong and strange taste of vegies. Ensabi Guring @ RM10, is a bitter mustard leaves stir-fries with garlic. When it comes to dessert, please remember to order their signature The Special @ RM13. It is a combination of the Tuak Iced Cream and Asi Manis Ice Cream. 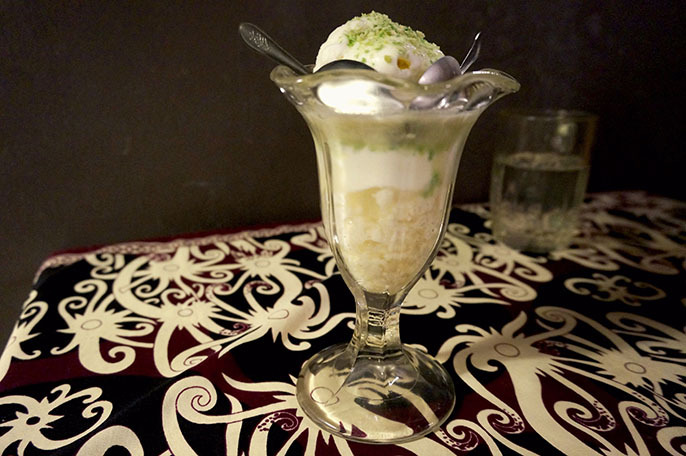 It consists of 2 layers of this special dessert, which fill sticky rice at the bottom, and a big scoop of ice cream at the top. Dayak also have their own special brew wine. 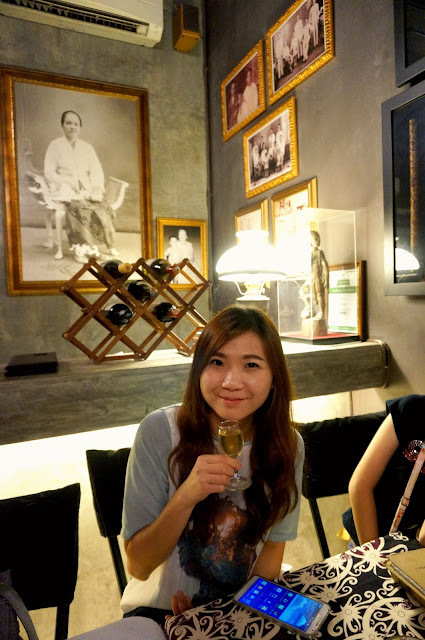 Try their Tuak Stambuk Ulu Wine, before or after your meal. It worth a try because it is special made from glutinous rice by the Iban. RM16 for one glass, like the one I am holding it. RM80 for one 750ml bottle. It really worth a try, no matter it is a glass, a bottle or even a snip of it! 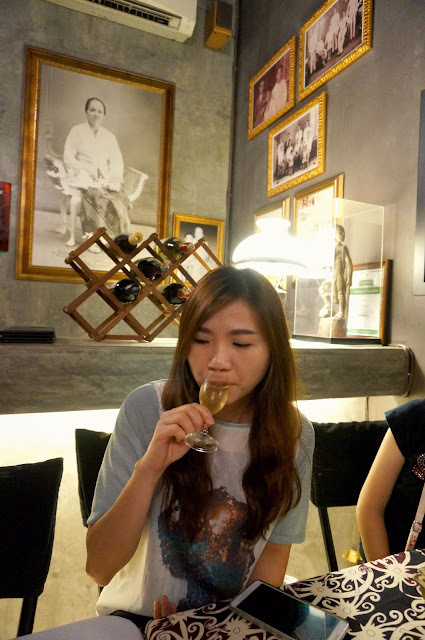 The taste is very different to other wines you get from other places. We thanks for the special dinner of that night which organized by Kay, Stella, Andrew and Chuan. The foods are very special than what we usually have in KL, a bit extra ordinary; but it was a GREAT experience after all! What's more! Stay tune for my part 2 eat with me @ Kuching Sarawak soon!